As illustrated in Figures 4.2.2c and d, when the crack extends by a tearing mode of fracture, which typically occurs in thin metal sheets or in tough materials, the crack extension is essentially slow and stable. 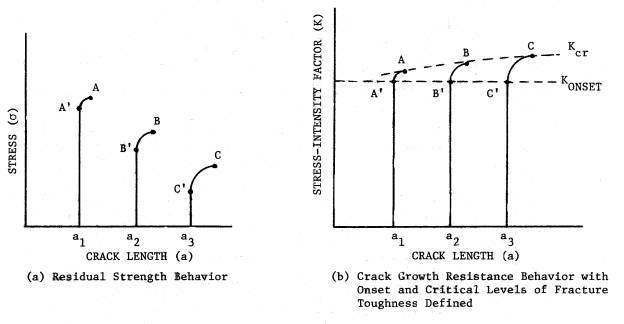 The failure condition for tearing fractures depends on the crack growth resistance (KR) behavior of the material and the applied stress-intensity factor K, which in turn depends on the crack and structural configurations. Figure 4.2.7 describes the observations that lead to the development of the crack growth resistance curve (KR vs. Da). Figure 4.2.7 a and b present the tearing behavior as a function of applied stress and the corresponding stress-intensity factor, respectively. Figure 4.2.7c presents the crack growth resistance curve that is a composite of the three stress-intensity factor curves shown in Figure 4.2.7b. Note that the composite was created by using the amount of physical crack movement observed in each case as the independent variable. As implied by the data points on the crack growth resistance curve in Figure 4.2.7c, the stress-intensity factor level associated with material failure is not necessarily constant. 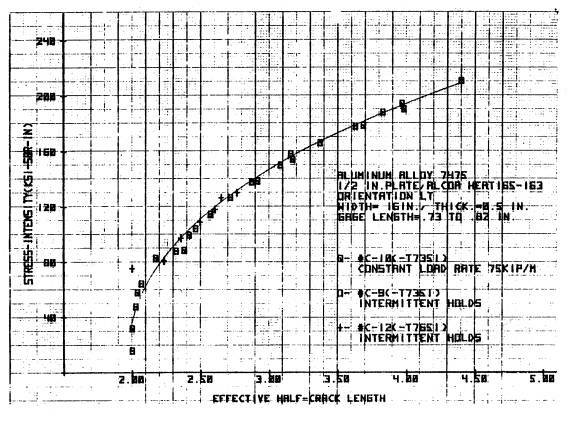 Shown in Figure 4.2.8 is a resistance curve for a 7475 aluminum alloy described as a function effective crack length [Margolis, et al., 1975]. The effective crack length is the sum of the physical crack length and the plastic zone size corresponding to the current crack length and loading conditions. Indeed, while the shape of the resistance curve is basically independent of crack length or other geometrical effects, the fracture level is a function of crack length (see Figure 4.2.9). To account for this variation in fracture critical level, a two parameter failure criterion was required. However, before introducing the two parameter criteria that are used for more accurate estimates, approximate single parameter criteria for tearing failures are presented.